The EU has passed numerous directives and regulations to help keep people safe when using and transporting potentially dangerous corrosive substances and there are long-standing treaties such as ADR and RID that regulate their transportation by road and rail. An important part of ensuring the safe transportation, and end use, of corrosive goods is their correct labelling and marking through the class 8 label and placard. 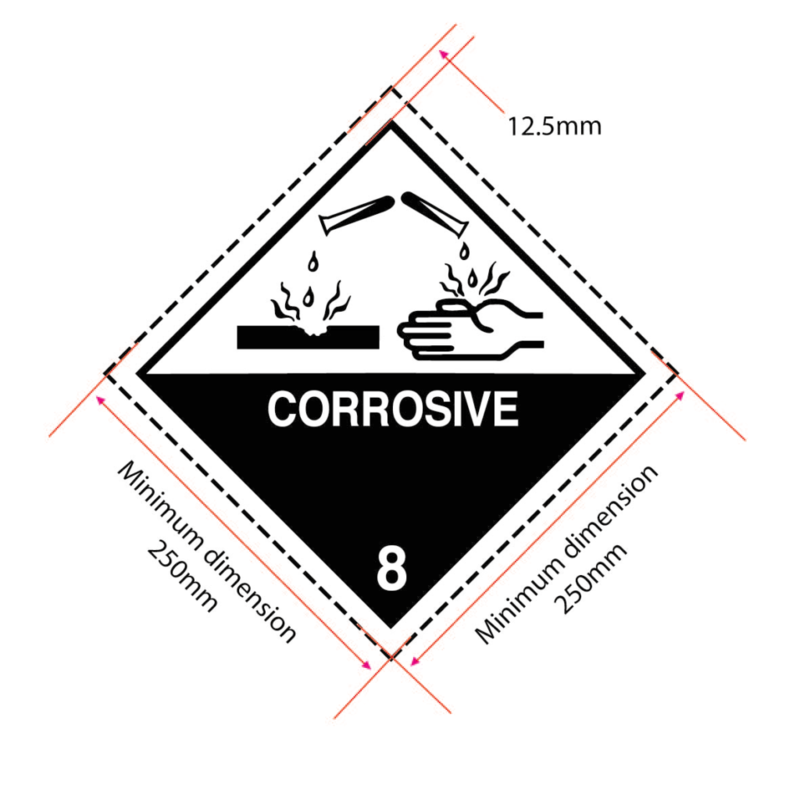 WHAT ARE CLASS 8 CORROSIVE SUBSTANCES? Under the UN recommendations, there are nine danger classes for hazardous goods and it is Class 8 that covers Corrosive Substances. Substances and articles in this class will cause severe damage by chemical action when in contact with living tissue or other materials. Most, but not all, are acids and alkalis and corrosives can come in many different strengths, mixtures and solutions. A few substances in this class can corrode glass, earthenware and other siliceous materials and many will react with incompatible or unsuitable packaging or metals, therefore, it is of vital importance that care is taken to ensure that containers and packages are made from the correct materials. Labels must also be manufactured from a material that withstands any leakage and remain legible and stuck to the container; paper labels are not suitable for corrosive substances. In storage or transit, leaking corrosive substances may damage the packaging of other dangerous substances, creating further leaks and in some cases they can react with one another and may give rise to greater hazards than the individual substances. Metal corrosion can be an issue for corrosive substances that aren’t even irritant to skin tissue (especially low concentrations of acids on steel and low concentrations of alkali on aluminium) because if such substances leak during transport, they could destroy other freight or even seriously damage the vehicles in which they are being transported. Examples of corrosive substances and articles can include: acid filled batteries, hydrochloric acid (spirits of salts and pool acid), sulphuric acid, quicklime, iodine, potash, sodium hydroxide (caustic soda) and soldering flux. 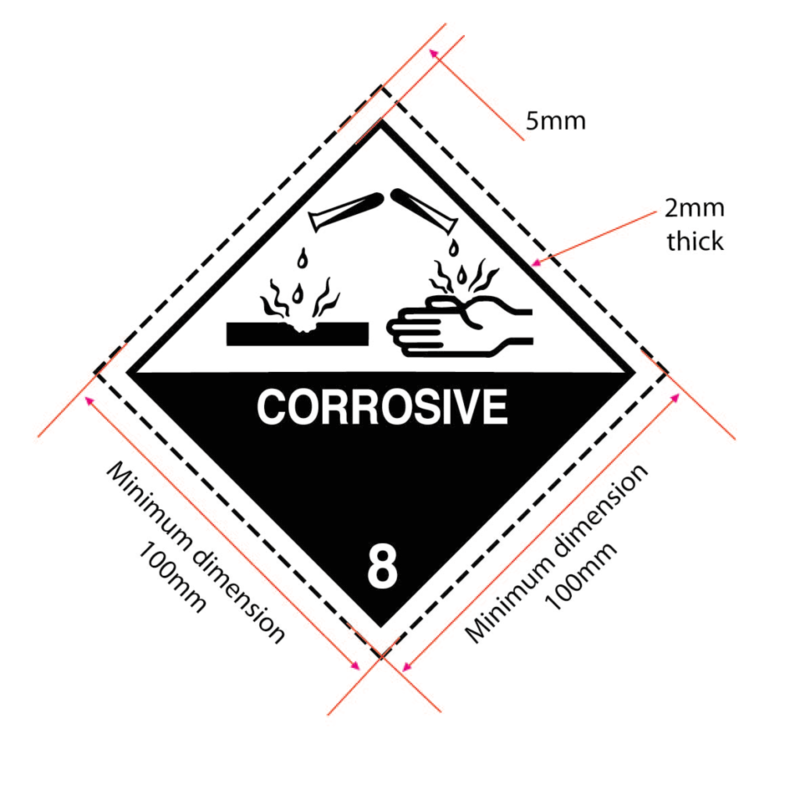 The corrosive Class 8 label for packages must be at least 100x100mm, from edge to edge, and set at an angle of 45°. The label must show a dotted outer boundary line (unless it is being applied on a background of contrasting colour). The class number ‘8’ must be shown in the bottom corner and be in text at least 12mm high. Additional text saying ‘Corrosive’ may be shown in the bottom half of the label. The inner black line of the label must be at least two millimetres thick and there must be a gap of 5mm between this and the outer dotted border or the outer edge of the label. The upper half of the label must contain the symbol of the test tubes spilling a corrosive substance onto the hand and metal block. A symbol showing a shaded hand can also be used. The Corrosive Class 8 placard is used for cargo transport units such as freight containers and road/rail tanker vehicles. Class 8 placards must be at least 250mmx250mm, from edge to edge, and set at an angle of 45°. The placard must show a dotted outer boundary line (unless it is being applied on a background of contrasting colour). The class number ‘8’ must be shown in the bottom corner and be in text at least 25mm high. Additional text saying ‘Corrosive’ may be shown in the bottom half of the label, but this is not mandatory. There is no specification for the thickness of the inner line, as yet, but there must be a gap of 12.5mm between this and the outer dotted border or the outer edge of the label. The upper half of the label must contain the symbol of the test tubes spilling a corrosive substance onto the hand and metal block. A symbol showing a shaded hand can also be used. All of the Corrosive Warning Diamond Labels and Placards manufactured by Stock-Xpress comply with IATA/ ICAO, UN ADR/RID and IMDG/IMO requirements, and are made from materials that meet the strict BS5609 standard. BS5609 is a specification for labels that are intended for marine use, whereby both the ink and the substrate must be able to withstand 3 months continuous immersion in sea water and still be legible and have good adhesion. 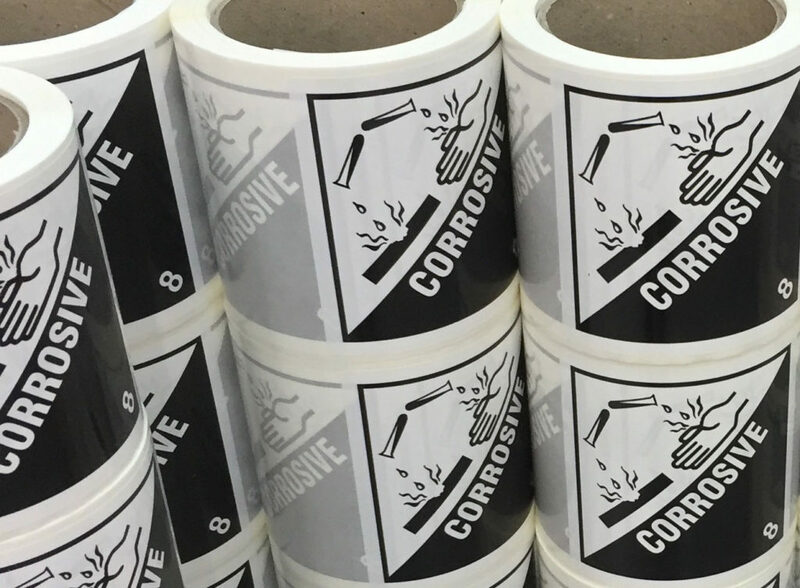 We manufacture the Corrosive Class 8 label at 101x101mm on rolls of 250, and as single cut labels at 100x100mm. Our placards for international transport are 250x250mm and 200x200mm for Hazchem panels that are used for UK transport only.